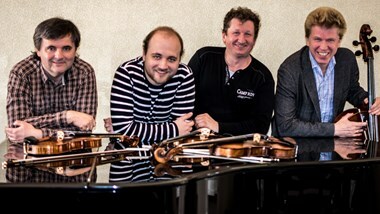 The ever popular Coull Quartet return to Benslow Music to offer ten preformed string quartets their usual expert advice and encouragement. Quartets are free to bring along any repertoire they choose and the course also includes a ticket to their concert on Friday 1 November (when the winning pieces of our 2019 Young Composers Competition will be premiered). Please note that any quartets wishing to arrange a pre-course playing room between 2.30pm - 6.30pm on the first day must contact us prior to the course to avoid disappointment.